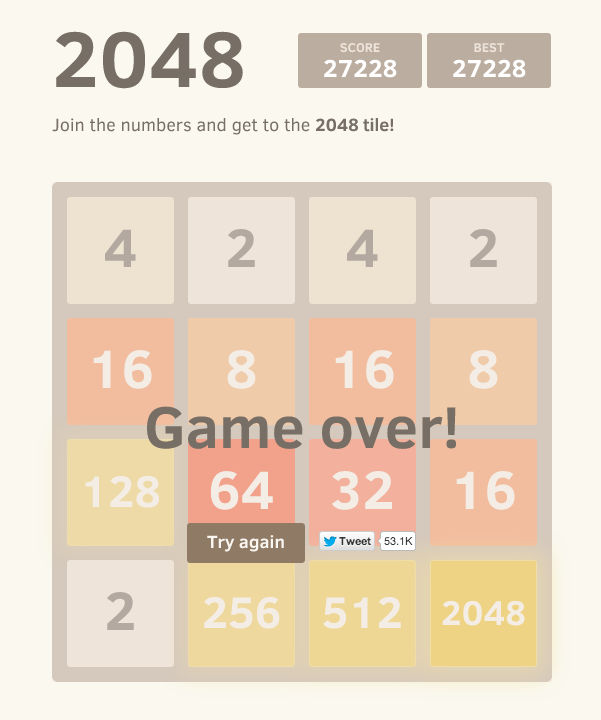 Lately I’ve been spending way too much time playing 2048 by Gabriel Cirulli. It’s a ridiculously simple (to play; not to win) puzzle game: you use the arrow keys to slide numbered tiles around on a 4 by 4 grid; tiles with the same number merge when they collide to form one tile with double the number; a 2 or 4 tile drops randomly on each turn. 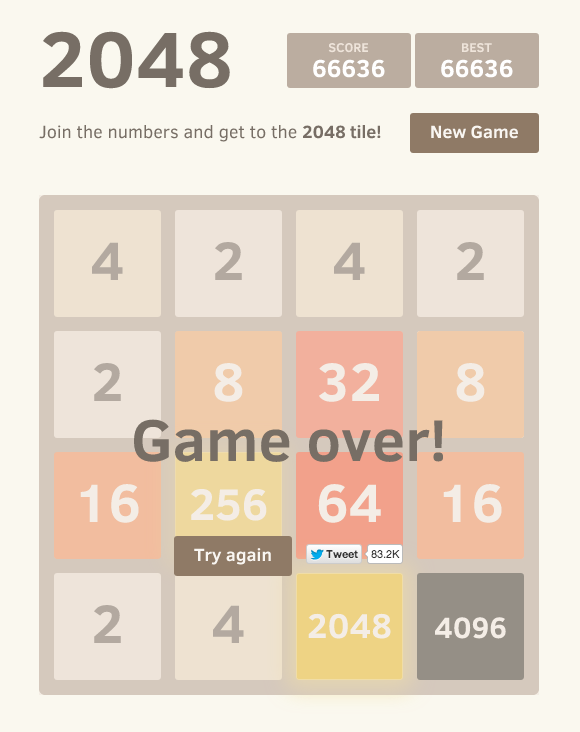 You “win” if you make a 2048 tile, but you can then go on to try to increase your score after that. I try to keep my highest numbers in the bottom row, with the highest one in the lower right corner. The point is that, say, a 512 can’t merge with anything but another 512; if there’s a 512 next to a 2, the 2 gets “starved” because you can’t “feed” it from that direction until you’ve built it up to 512 (or you move the 512 and 2 apart). On the other hand, it’s great to have a 256 next to a 512 because once you “feed” the 256 and turn it into a 512, you can then merge the two 512s right away. Keeping the high numbers in the bottom row means I almost never use the up arrow. Lift the bottom row and you’re likely to get a 2 or 4 placed under it! Where it’ll starve, taking up space; meanwhile the high number it’s shoved up is starving low numbers around it. I also try not to use the left arrow unless the bottom row is filled, or there are no legal right arrow or down arrow moves. Again, if you move the bottom row left, you run the risk of getting a 2 or 4 shoved in on the lower right next to your biggest number. It’s not likely, unless there are few vacant spaces in the grid, but it can happen. If the bottom row is full (and there are no pairs to merge in it) then the left arrow is safe, of course. So most of my action happens on the lower left. I build up a number on the left side (first or second position from the left) of the second row I can merge with the number below it. Then merge. Repeat until there’s a mergeable pair in the bottom row. Arrow right to merge them… and now things are dangerous, the bottom row’s not full and I try to avoid left arrows until a tile appears in the left column and I can drop it to the bottom. Occasionally I run out of right and down moves in that situation and have to hold my breath, hit the left arrow, and hope the new tile doesn’t show up in the bottom row. If it does it’s hard to recover the game, once you’ve built up the highest number to 256 or so. If it doesn’t, of course I always move right on the next move. Of course it’s good to have numbers in a powers-of-two sequence orthogonally connected. Then when you get two of the lowest number next to one another you can merge them, then merge that with the next, merge that with the next, and so on, eating up the whole sequence at once. Other than that, I pretty much play by learned instinct based on previous games. Lately if I can avoid stupid moves (like an ill-conceived up, or left with the bottom row unfilled) I find I can get to 2048 a fair fraction of the time. Maybe more than half. I’m going to brag by putting up an image of my best game. Feel free to avoid looking at it if it’ll just irritate you. Feel free not to rub my face in it if you’ve done better. I’ve now retired from 2048. No really.